These earrings are made of small orange and black capacitors, with letters, numbers and symbols. 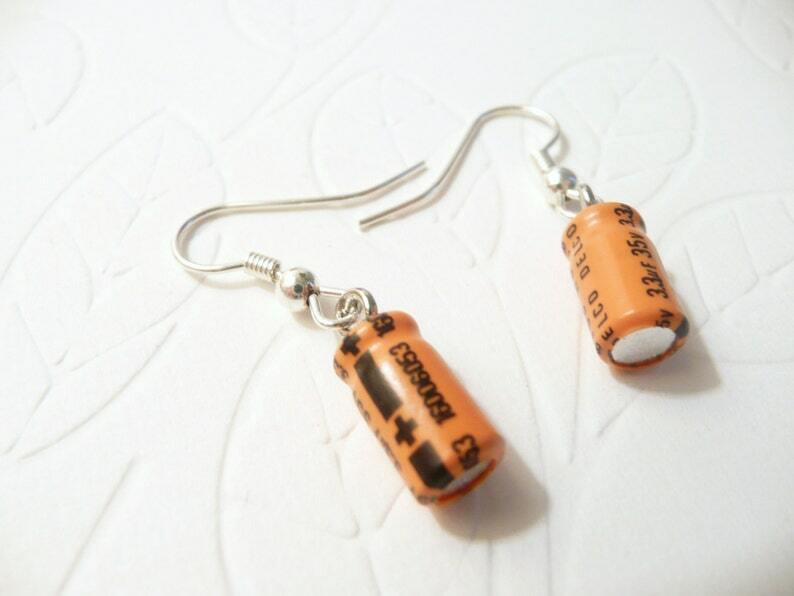 Fun, conversation-piece earrings for the computer nerd! New, lightweight capacitors are finished with surgical steel fishhook-style ear wires. SIZE: Capacitors are about 1/2 inch long. Earrings measure approximately 1 1/4" long (3.2 cm) from the top of the hooks. These are NOS - new old stock, unused, but they most likely would have been thrown away so we've recycled them as unique jewelry! NOTE: I have a lot of these capacitors, and the exact placement of specs on the earrings you receive may vary slightly from the earrings in photos.